A new friend suggests we take each other for a backpacking “test run” to find out how compatible we are as hikers and campers. Being a Coloradan, she suggests a trail she has done 15 years ago for our test. Dunraven Glen. Or Glen Haven. We find the trailhead quickly. “North Fork Trail.” The map kiosk at the trailhead shows us we’ll be hiking in the Comanche Peak Wilderness just outside of Rocky Mountain National Park. The Wilderness is found within the Roosevelt National Forest. Comanche Peak Wilderness is vast. At 67,000 acres, it is named for its most prominent peak, and was established in 1980. About 120 miles of hiking trails are found inside the wilderness. 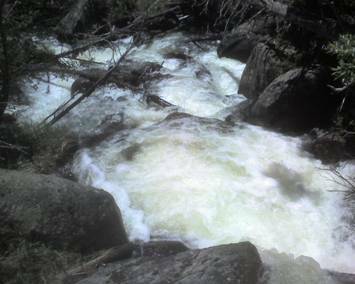 From the trailhead, the trail quickly descends into a valley, where it follows the Big Thompson River, which at this time of year (late June) is a roaring, narrow whitewater creek. Immediately, it occurs to me: my mouth waters, as the creek appears ideal for whitewater kayaking. And me here without my newly-acquired kayak! Who knew? Soon, our rock-strewn, often eroded but relatively wide trail passes a boy scout camp. About 90 minutes from the trailhead, the trail opens up into a lush valley overlooked by the ruins of a historic cabin (looking well over 100 years old). Sufficiently idyllic in views and proximity to the creek that we decide to stop and set up camp. The builders of the cabin surely believed as we did that the location would be a pleasant place. Dinner is leftover stew that I had made the night before. In 1976, the Big Thompson killed 144 when a year’s worth of rain fell in a few hours and created a biblical flash flood. We both have a fitful night of sleep. Quite a bit colder than we anticipate. And Big Thompson is running so vigorously that we are surprised to decide the next morning, groggily, that the river is TOO LOUD to sleep near. The continuous sound of the river reminds one of a night of howling wind and rainstorm. Not the most conducive for a night of sleep (normally, of course, the sound of a babbling brook has a tranquilizing effect). I’m up early the next morning. Early enough to watch the warming sun rise over the mountains to our east. The plan agreed to the night before is that we summit the steep ridgeline across the meadow to our north. I’m eager to do so, as the elevation appears ideal for unforgettable views. 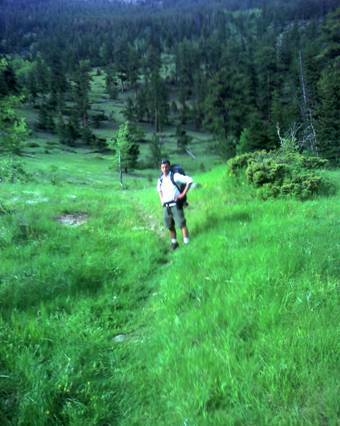 Daypack and water accompany us as we cross the meadow and begin our ascent. Soon, we find ourselves in a dense pine forest and large fields of granite. Within an hour, we reach large granite rocks that we ascend for our viewpoint perch. Below us is an astounding view of a Comanche Peak Wilderness valley, and still snow-capped peaks in the distance. Even here, a fairly long ways away, Big Thompson is clearly heard below in the valley. The volume makes me realize that this river has a rapid elevation descent as it crashes over logs and rocks. We descend back to the valley and begin hiking west as the valley slowly ascends in that direction. Along the way, my friend is unable to resist having us find a relatively quiet, safe pool of water along the rampaging river so that we can enjoy some secluded skinny dipping. The water, of course, is frigid cold snow melt water. A quick dip and dunk. The water is immediately numbing, but the warmth of the sun and the exhilaration of escaping the water makes for a pleasant experience. We head north to get back to the trail. My path, unfortunately, brings us into a bog, so we divert west a bit and soon find the trail. Wildflowers are just starting to emerge. Columbine. Indian Paint Brush. Raspberry bushes that beckon us to return in a few weeks when they have fruited. Test run conclusion reached: We match well. Future backpacking is certain.